Have you ever come across people who take much trouble to churn out a perfect video, get their tools right, choose the perfect setting, but the audio output isn’t of great quality? Or those that have a great video, but one that isn’t clear and therefore cannot be transcribed properly? Great videos need a great audio to go with them. While this by itself is sometimes sufficient, complementing them with textual content often goes a long way in making them SEO friendly, giving the video context, making it more interactive and accessible to a much wider audience online. 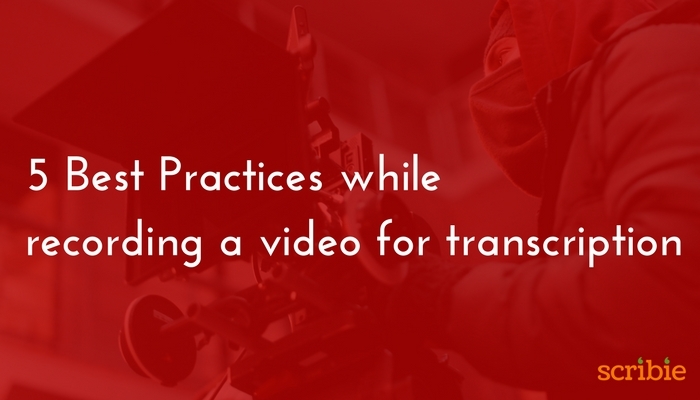 Transcribing videos is an essential component of a great video and below are 5 best practices to follow while recording a video for transcription. There is nothing that works better than proper planning. Before pressing the record button on a video, before even getting down to set up space for it, it is important to plan what you want to record and how you want to do it. Factor in any additional inputs needed for the video transcription once the recording is done. Planning does away with much of the stress of recording and even helps the post-production work. If the quality isn’t great because of incomplete planning, even a professional video transcription services company will not be able to lift it up with its content. Not to mention, the amount of hours that will have been wasted recording it in the first place. A well put together script isn’t just about keeping content relevant during a video recording, but also ensuring that it targets the right audience as well as is easy for transcribing and SEO. Having a script in place ensures the content is delivered seamlessly, has the right keywords when transcribed and helps you stick to important information while recording. This is one of the most important things to consider because an unprepared work space is a chaotic one and nothing ever happens in chaos. Preparing your recording area starts from tidying up your space, selecting the right equipment and tools, looking into the space around – both on your desktop and in your office/home and the location you will be recording in. A great video transcription comes about from a video that is well recorded, clear, succinct, to the point and without any distractions. Video transcription complements an audio script and therefore, the recording must always be superlative in the first place. Practicing the content and flow of speech before hand makes it easier to edit and transcribe later, whether you do it yourself, it gets done by professional video transcription service provider or an online video transcription freelancer. The phrase ‘ Practice makes perfect’ isn’t an empty one. Practice what you are going to say so that when the actual video recording happens, it is seamless and easy to understand. The beauty of video recording is that except for minor hiccups and flaws, many other things can be ironed out while editing. Hums, background sounds, uneven voice tones and sound disturbances can all be evened out by editing software and video editors. However, since transcribing them is as essential, it is important to keep such glitches at a minimum and incorporate certain relevant keyword pertaining to your business within the video content itself when recording. While there are several more such good practices when it comes to video recording especially to do with the technical aspects, it is ultimately how it all comes together that is really important. If you think that this is too much of work on your hands, there are always ways to outsource some part of your work. Many online video transcriptions services can do the transcribing work for you. You can find out video transcription rates and budget your work accordingly to ensure you get a great looking video, and more importantly, one that reaches out to as many people as possible.